Some musicians like to call each other “doctor”, simply as a term of endearment or respect for another’s musical prowess. In the case of Eddie Henderson, the appellation is appropriate on every level. A practicing physician, psychologist and a jazz musician, who received his first trumpet lesson from Louis Armstrong, and counted Freddie Hubbard and Lee Morgan among family friends; Eddie Henderson’s musical career is fairly unusual in that he achieved some renown in the fusion world before garnering mainstream jazz acclaim. As Miles Davis was also a family friend (A teenaged Henderson once had the cojones to say to Miles “You don’t play correct.”), it was no surprise that the young Henderson came under Davis’ influence; and in the early ‘70’s that meant jazz-rock-funk fusion. Henderson played with Herbie Hancock’s Mwandishi band from 1970 – 1973 and recorded his first two discs as a leader, (Realization and Inside Out) backed by that group. Apart from the powerful fusion of those discs, most of his output as a leader from the 70’s is commercial, albeit well-played. As the 1990’s brought a more hospitable climate for traditional styles of jazz, Dr. Henderson began to return to straight-ahead playing. Over the last 15+ years, he has garnered some of the critical acclaim that had eluded him in the past. Generally, his recording group now is a quintet or sextet that includes the outstanding vibraphonist Joe Locke as a second lead voice. Henderson’s recent music has been as warm, inviting and interesting as anything around today. Eddie Henderson is still going strong at age 70. He released a new quartet album late last year, with John Scofield, Doug Weiss and Billy Drummond, titled For All We Know. It’s a laid back but swinging date, highlighted by a take on his old boss Herbie Hancock’s “Cantaloupe Island”. 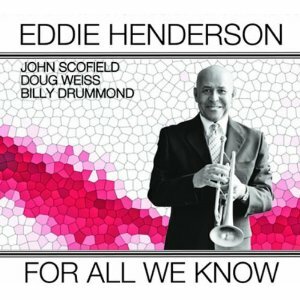 If you don’t know Dr. Eddie Henderson yet, check these discs out. There’s a lot to like. This entry was posted on February 5, 2011 at 7:53 am and is filed under Obscure Trumpet Masters with tags Eddie Henderson; Miles Davis; Herbie Hancock; Mwandishi. You can follow any responses to this entry through the RSS 2.0 feed. You can leave a response, or trackback from your own site.